Paris has been talked about in superlatives down the ages. Reams have been spent on describing the beauty of the city and its landmarks, quite a few of which have been witness to monumental events in history. Much of the grandness of the city and its magic is owing to these places, which have survived to tell the tale of the bygone era. Visitors, on their maiden trip to the French capital, arrive with a good deal of expectation and to make sure that they cover all the places to visit in Paris. It always helps to have a quick list of the places to visit in Paris, so that you do not regret missing out on something. Eiffel Tower: Paris is almost synonymous with the Eiffel Tower. Visiting this stunning monument often marks the beginning of a trip to the City of Light for many. Viewing the city from the top certainly gives a high. 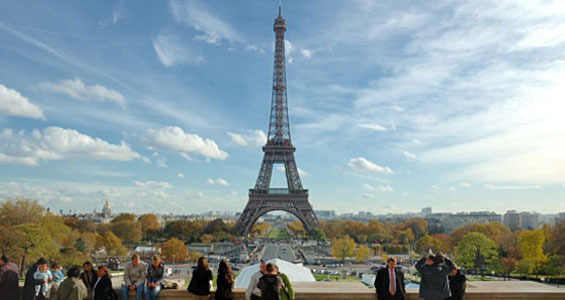 There are a number of attractions close to the Tower and you can drop into the Musee du Quai Branly, the Palais de Chaillot and the Musee Marmottan Monet. Notre Dame: The Notre Dame Cathedral and the popular ile de la Cite certainly form the jewel in the crown for the city. The Palais de Justice is located close by and finds a mention in the historical annals, more specifically during the time of the French Revolution. You cannot afford to miss the wonderful glass mastery at the Saint Chapelle and the Pont Neuf Bridge. It is certainly one of the places to visit in Paris. The Louvre: The mention of the name itself inspires awe. Perhaps one of the biggest and well known museums in the world, the Louvre boasts of an unparalleled art collection, which certainly includes Da Vinci’s masterpiece Mona Lisa, and historical artifacts of great relevance. The Tuilleries Gardens are located close by and so is the Orangerie that plays home to the Water Lily paintings. Champs Elysees: This may as well be referred to as the romantic heart of the city of Paris. In fact, you are likely to come across a steady flow of people in this area, taking a stroll down the streets or shopping to their heart’s content. Some of them cannot just get enough of the colossal Arc de Troimphe. Tourists are also seen opting for the Seine River cruises, which leave from close by. The city has something or the other to offer every visitor who drops in. The list of places to visit in Paris is perhaps endless. You will discover in no time that the city is as enchanting in the summers as it is in the winters and thus makes for a wonderful trip. This entry was posted in Top Places to Visit in Paris and tagged Champs Elysees, Eiffel Tower, Notre Dame:, The Louvre. Bookmark the permalink.